We have indigenously developed and designed the very efficient valves, like Dom valves, Isolation valves. Specially design and developed Transporter vessels assist in very low friction conveying of dusts. Specially designed controlling mechanism are provided. We can also supply lean phase system, depend on applications. Pneumatic conveying systems are particularly versatile. A very wide range of materials can be handled and they are totally enclosed by the system and pipeline. a hopper or silo in one location to another location some distance away. Considerable flexibility in both plant layout and operation are possible, such that multiple point feeding can be made into a common line, and a single line can be discharged into a number of receiving hoppers. With vacuum systems, materials can be picked up from open storage or stockpiles, and they are ideal for clearing dust accumulations and spillages. Pipelines can run horizontally, as well as vertically up and down, and with bends in the pipeline any combination of orientations can be accommodated in a single pipeline run. Conveying materials vertically up or vertically down presents no more of a problem than conveying horizontally. Material flow rates can be controlled easily and monitored to continuously check input and output, and most systems can be arranged for complete automatic operation. Pneumatic conveying systems are particularly versatile. A very wide range of materials can be handled and they are totally enclosed by the system and pipeline. The Dense Phase Conveying System is the most advanced, efficient and most reliable system to convey material with wide range of capacities of dry bulk solids up to 200 TPH, with terminal distances exceeding - 1,200 meters. This system includes weighing, batching, blending, lump breaking, storage, master control equipments etc. 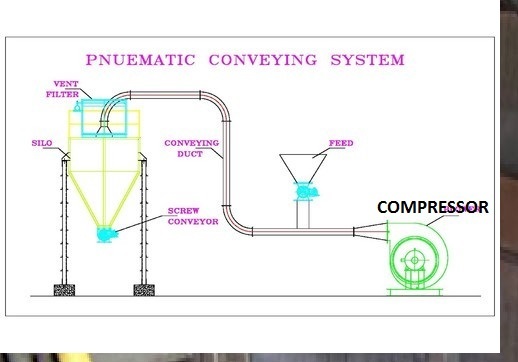 through Dense Phase Conveying System for bulk material handling in the plant. Dense Phase System is used to push and convey the highly dense concentration of bulk solids materials effectively at a low constant speed inside the conveying pipe lines. Any type of material (heavy, abrasive or, fragile, crystalline or granular ) can be conveyed without causing the degradation due to low velocity and less wear to the system components. Dense Phase System is reliable, flexible and maintenance free due to lower quantum of moving parts and it can also be easily installed at location, where space availability constraint is there. The low volume of air is utilized at the ash / transporting vessel to convey the material into the line at maximum density while the balance air quantity is added along the conveying line through coupling unit provided at starting on the pipeline to overcome the pipeline frictional losses thus pumping material at the highest obtainable efficiency. The Coupling Unit ensures a uniform gradient and helps to maintain the material at maximum density. It also helps in maintaining the desired velocity, and over coming the pipeline / bend's friction and helps to restart the flow of blocked material if any along the conveying line regardless of length. These Coupling Unit also helps in minimizing the compressed air consumption and pipe abrasion. Lean Phase system works on low air pressure, herein material is conveyed in suspension in the flowing air. To keep the material in suspension in the pipeline it is necessary to maintain a minimum value of conveying line inlet air velocity that, for most materials, is of the order of 13–15 m/s.